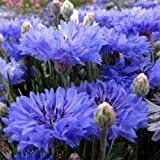 Centaurea cyanus growing herbaceous of the genus Centaurea also known as Cornflower, Centaurea cyanus annual used as ornamental or medical plant, can grow in temperate, subtropics or mediterranean climate and growing in hardiness zone 3-10a as spring planting or 10-11 in the autumn. 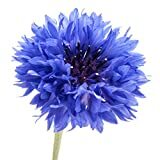 Flower edible color purple to blue the flowers petals like little horns base that divide several needle shape, the petals “sit” on green “ball” with spines on it. 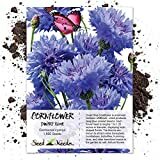 Bachelor Button Tall"Blue Cornflower Flower Seeds- 200 Premium Heirloom Seeds- ON Sale! 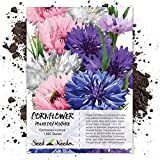 - Centaurea Cyanus - (Isla's Garden Seeds) - 99.7% Purity!